I know I'm not the only girl who sees something plain and is tempted to stick her monogram on it just to claim it as mine! After I got my license I would drive my parents crazy because I was constantly asking to borrow one of their cars to go see friends. Shortly after my dad went on a deployment and his car was all mine (for the time being at least)! I ordered a pink vinyl monogram and stuck it on the back window hoping he wouldn't care too much ;) Luckily when he got back my parents officially handed that car over to me (partially because my dad refused to drive a car with a pink monogram on the back) and it still has the pink monogram on the back of it today! 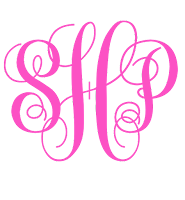 Monograms are such a classic look that most likely are never going to go out of style. Before I became familiar with photoshop I was determined to make everything using PowerPoint. 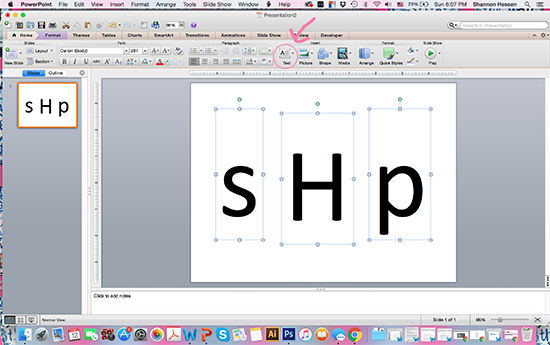 I quickly discovered little tricks that help you make almost everything you can make on Photoshop using PowerPoint. 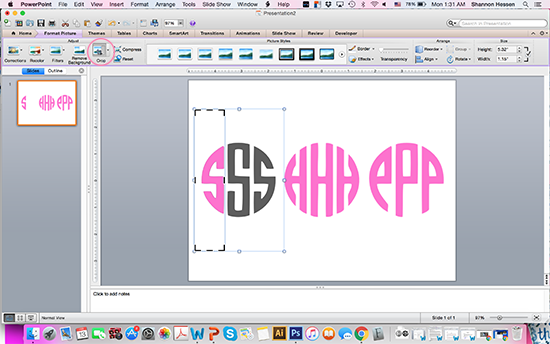 Although I switched over to using Photoshop for almost everything now, I realize that most people don't have that program so I wanted to make a tutorial about how you can make your own customized monogram using a program that's available to most people. 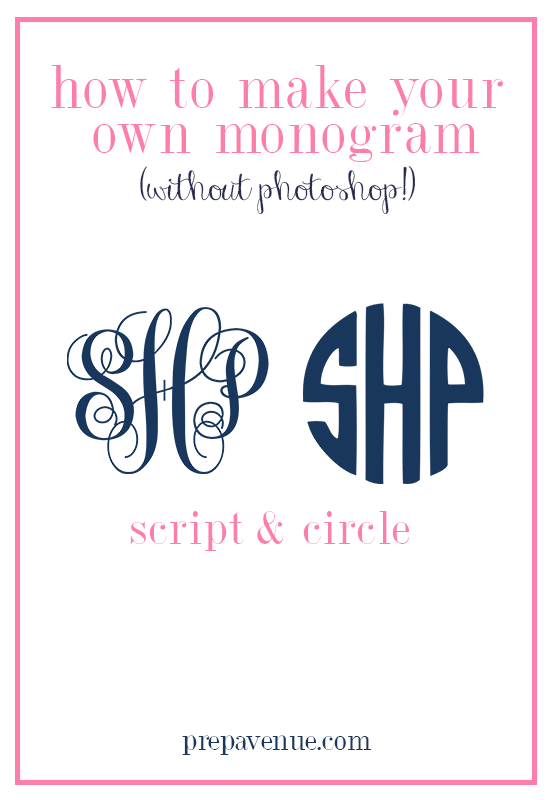 I have provided step by step instructions on how to make both a script and circle monogram. These are perfect if you want to add them to business cards you're making, resumes, blogs, binder covers, or anything you wish to really! Comment if you have any questions and I will try my best to answer all of them. I also took screenshots to try to help you through the process. I have a mac so it may be a little different for you if you are working on a pc. 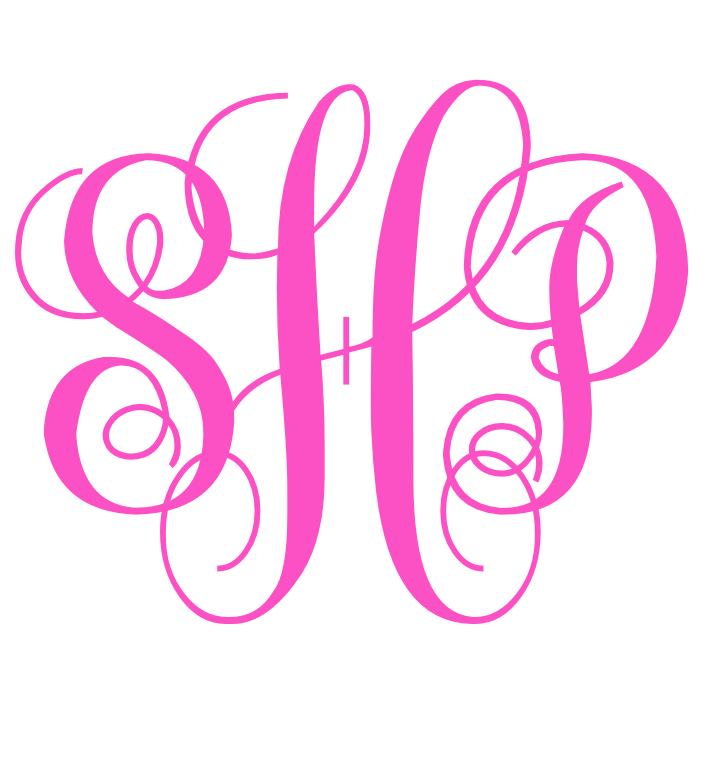 I love the script monogram look. It's so classic and in my mind it can be added to most anything and look tasteful. This monogram is pretty simple to make in PowerPoint and then you can add it to any fun projects you're making or print it out to hang on your bulletin board! I could honestly spend hours on free font sites like this one. 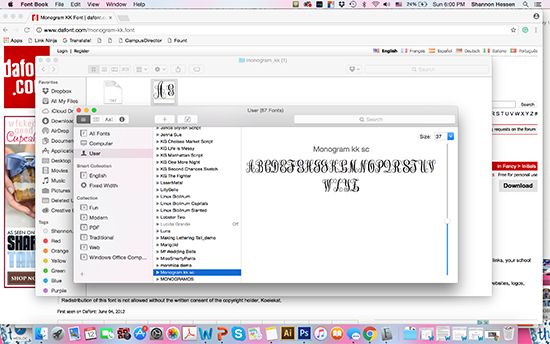 I get so overwhelmed by all the beautiful fonts that I end up downloading a million just for fun! Press the Download button in the right-hand corner (circled below). Once you press the download button it will either be downloaded to the little downloads bar at the bottom of your browser (if you're using Chrome) or to your downloads folder. Click on the file you have just downloaded to open it up. 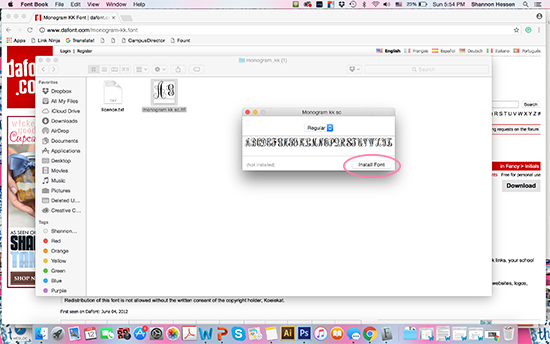 Once you have opened the file it should bring you to the font's folder that you just downloaded. 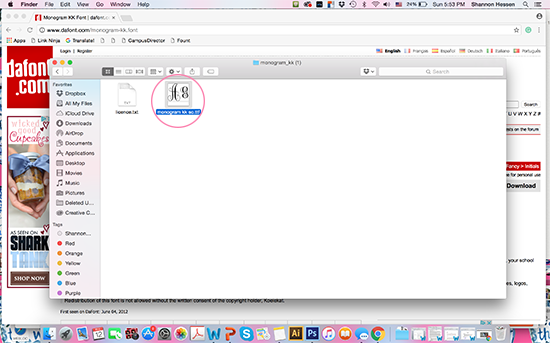 In the folder will be the license and the font file. 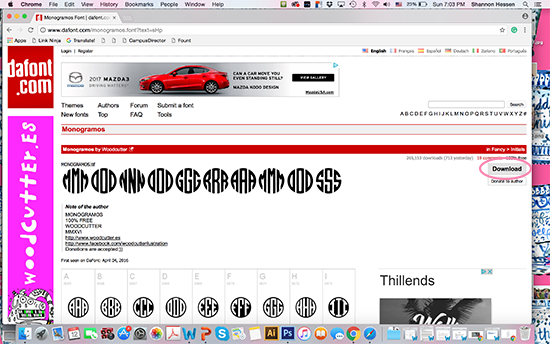 Click on the font file to install, the .tff file! 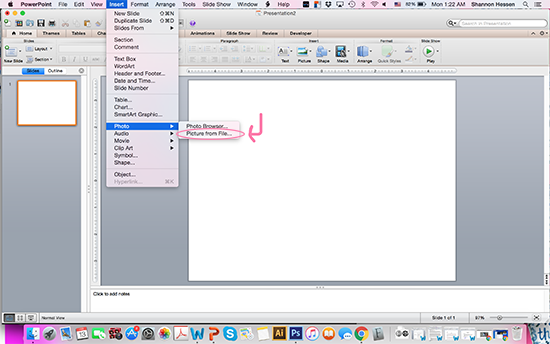 Once you have pressed on the font file, a window similar to this should pop up and you just need to click "Install Font"! 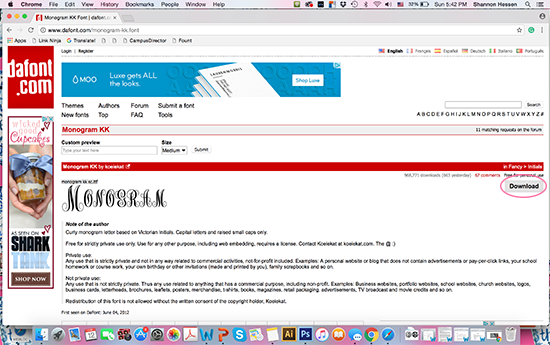 The font book should open up and show your downloaded font in your font book! Feel free to close this window. Your font is now successfully downloaded! Start with a blank slide template and put your three initials in 3 different text boxes. Remember to make your first and middle initial lowercase and then your last name, which will go in the middle, uppercase. For reference, mine were in font size: 287. 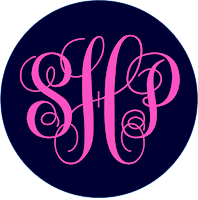 Traditionally the order of a monogram goes first, last, middle. So for example, my name is Shannon Patricia Hessen. But my monogram is: sHp (with my last name in the middle). 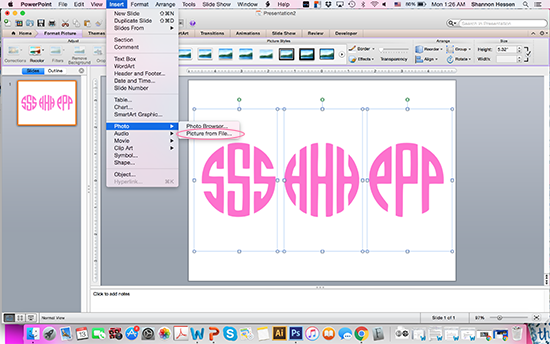 Now highlight the letters one by one (or all at once) and change the font to the font you just downloaded, "Monogram kk sc." 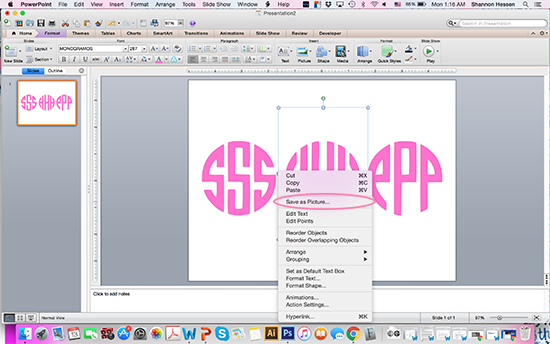 If for some reason it doesn't show up in your font selection on powerpoint, type in the name ("Monogram kk sc") and it should work. You can also change the color to whatever you chose to! 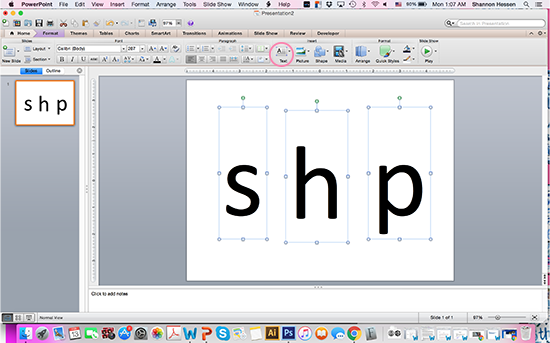 Move the two outside initials inside to overlap with the middle letter. 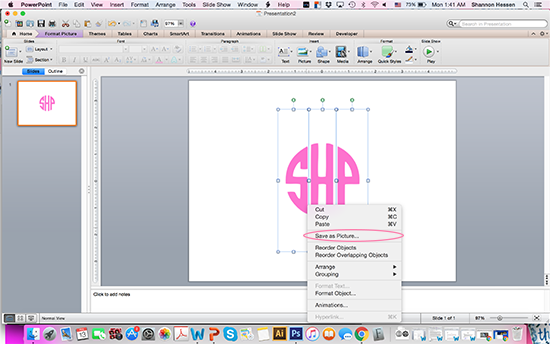 Typically in a script monogram the outside letters overlap significantly with the middle letter. 8. Chose what you're going to use it for, and save it! 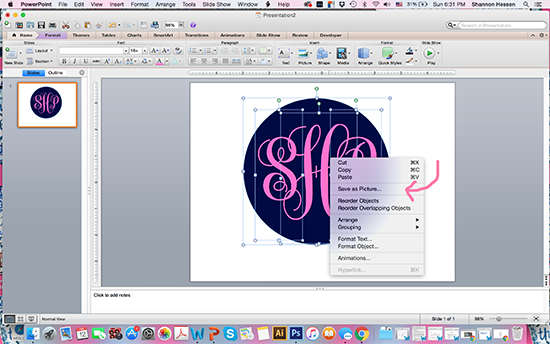 If you're going to paste it on top of something else (like a picture or background of some sort) you will want to save just the monogram with a transparent background. To do this, draw a box around the 3 textboxes with your mouse until all of the boxes are selected. Or click on one, hold down shift, and select the other two. Once you have all the text boxes selected, right-click on the picture, and press "Save as Picture." Select where on your computer you want it saved and it will save as a picture with a transparent background! 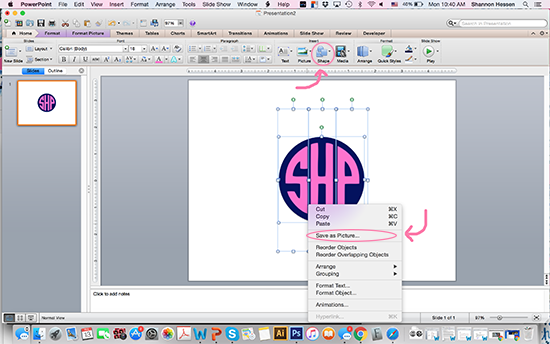 If you want to make a circle or box behind your monogram to put on a document, you will first need to draw the shape you want using the shape tool on powerpoint and place that shape behind the monogram. 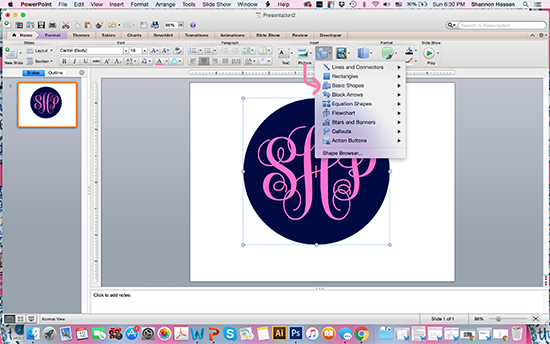 In this example I placed a navy circle behind my monogram. Once you have the shape you want, highlight all the objects (3 textboxes + your shape). You can do this by drawing a box around the 4 objects with your mouse until all of the boxes are selected. Or click on one, hold down shift, and select the other three things. Once all are selected right click over your selected objects and press "Save as Picture." Save your picture to your computer and it's ready to be put on anything you want! 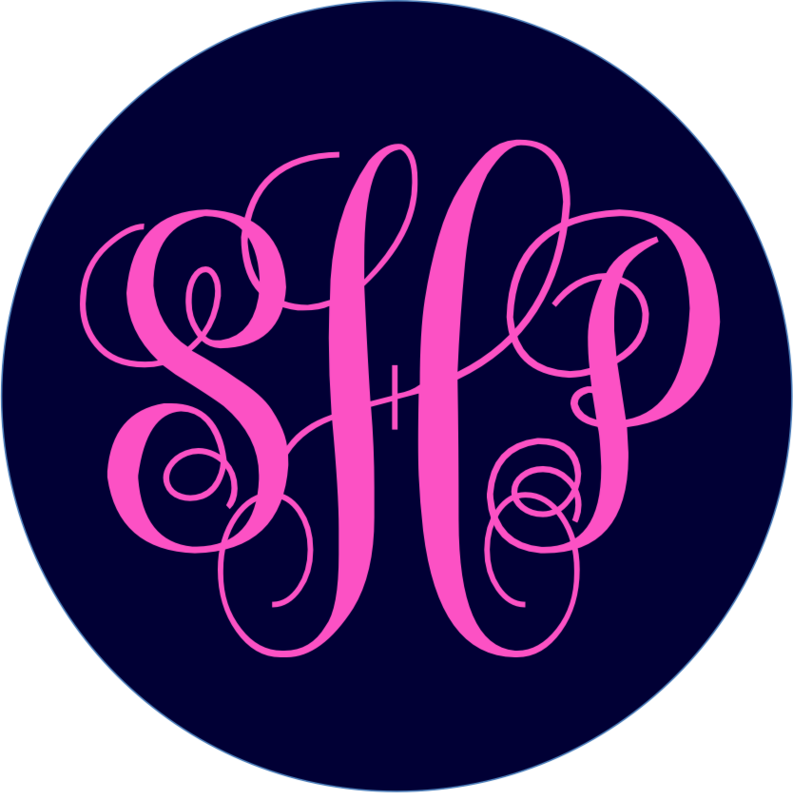 I love the look of the circle monogram! It's a little more modern and clean than the script version. This tutorial is a bit harder but don't worry because I'm going to walk you step by step through it all! 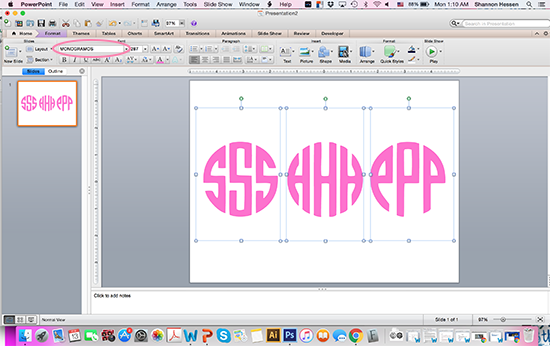 If you read through the script monogram steps, the process of downloading the font is going to be the exact same. 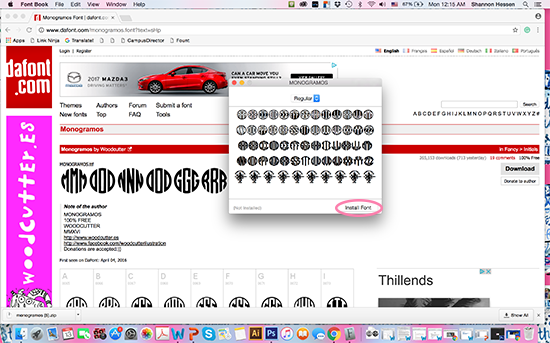 First, you are going to press the download button in the right-hand corner to start the process of downloading the font. 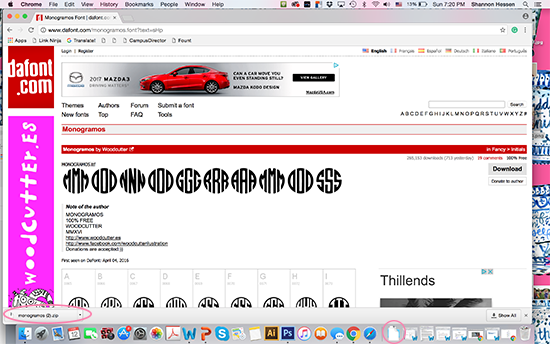 Click on the font file, it should be in a .tff file! Click install. Once you click install, it should open up to your font book. You can close out of that when you're done! Start with a blank slide template and put your three initials in 3 different text boxes. For this fond you will need to make all your letters lowercase. For reference, mine were in font size: 287. Now highlight the letters one by one (or all at once) and change the font to the font you just downloaded, "MONOGRAMOS." 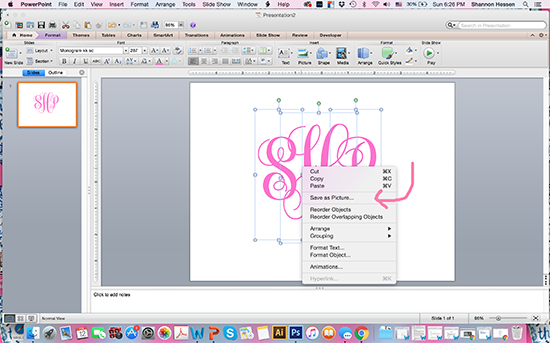 If for some reason it doesn't show up in your font selection on powerpoint, type in the name ("MONOGRAMOS") and it should work. You can also change the color to whatever you chose to! This is where it gets a bit complicated! Now you will need to select each text box individually, right click, press "Save as Picture," and then save each textbox to a folder you can easily locate. Do this for every text box (so three total). Once you have saved each text box as it's own individual picture you can delete each of the text boxes (so now your slide should be blank again). Now go to "Insert" in the top tool bar, "Photo," and then "Photo from File." Now you're going to insert the 3 photos you just saved back onto your slide. 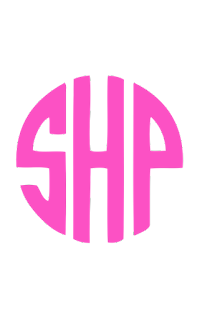 Now you are going to individually crop each photo so it will be ready to make into a monogram! Double click on each picture and press crop in the toolbar (circled below). Crop out the last two letters in your first initial, crop the first and third letter our of your middle initial, and lastly crop out the first two letters in your last initial. Your letters should now look something like this. Cropped so each photo only has one letter. Move each letter together to form the circle monogram. 11. Chose what you're going to use it for, and save it! Yay!! Hopefully it worked for you! If you have any questions at all feel free to comment and I will try to answer everything! Such a clever post, Shannon! 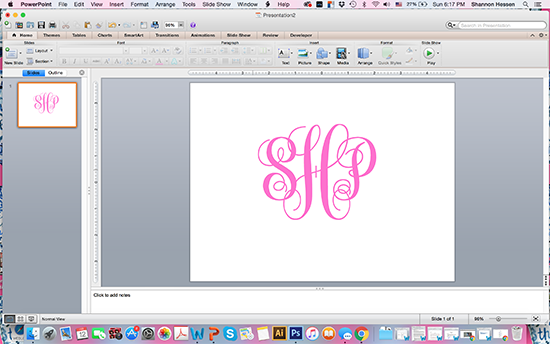 I braved Photoshop to make my monograms all these years but could have just been using PowerPoint this whole time! This is a KILLER tutorial!! Really appreciate you going step-by-technical step & not assuming we'll all just know certain things... us over-thirties aren't always as adept! Lol. Having a baby boy in May & am excited to play with his monogram now. THANK YOU!! Ordering a monogram sticker was one of the first things I did when I got my car too haha! Love this tutorial!